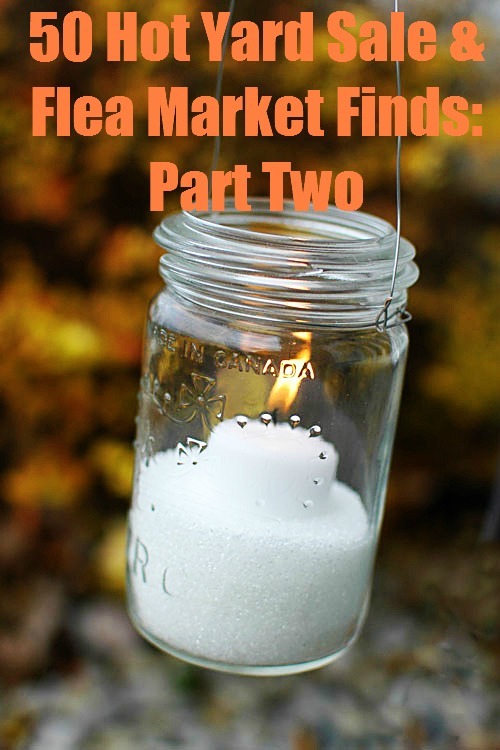 Yesterday we ran part one of 50 Hot Yard Sale and Flea Market Finds. 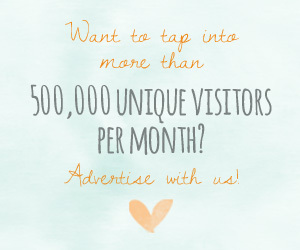 Don’t forget to check it out if you haven’t already! Before we proceed, I just thought I’d let you know that we’ve created a downloadable shopping list in pdf form that includes all of the treasures we’ve mentioned in part one and two. 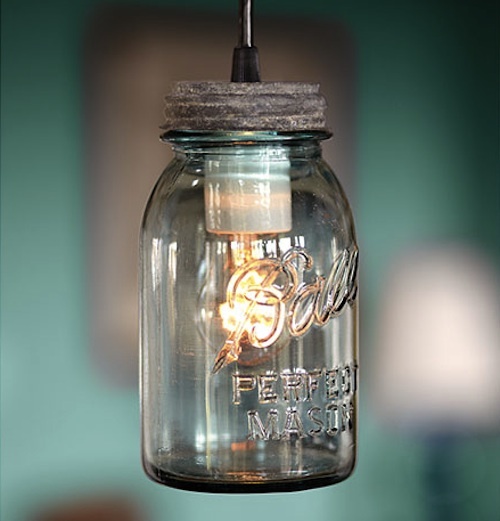 It will come in handy during your junkin’ excursions. 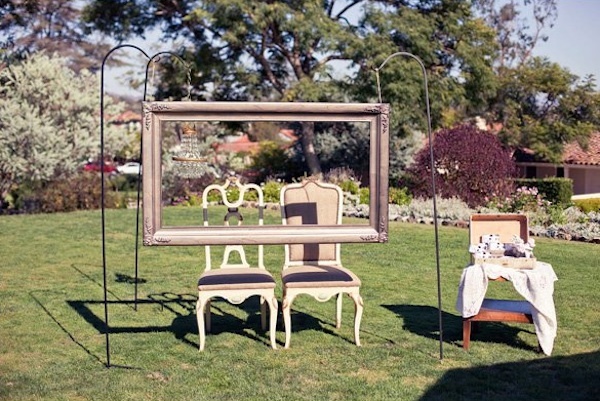 Download the 50 Hot Yard Sale and Flea Market Finds List. Let’s begin with wagons. They are so fun and versatile. 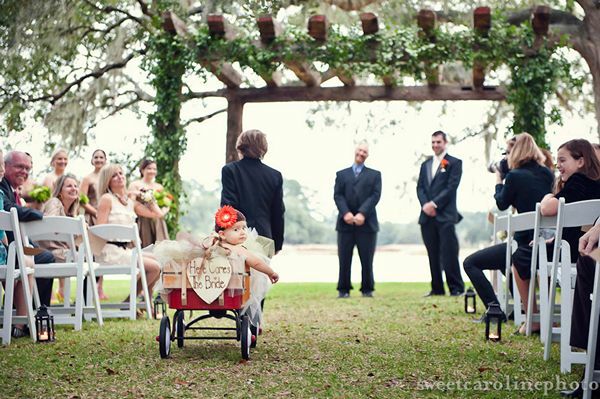 You can use them to store your beverages or favors – or better yet, use them is to give your pint-sized flower girl or ring bearer a free ride down the aisle. 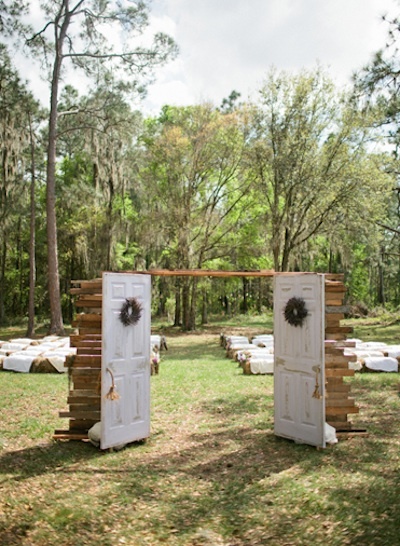 They will love being pulled down the aisle and your guests will love it too, especially with a custom “Here Comes the Bride” sign to announce your processional. 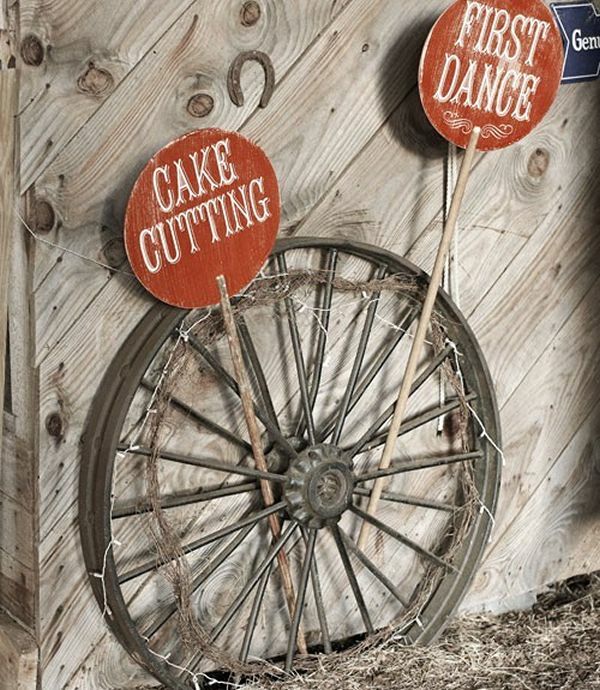 Wagon wheels are also a great way to add rustic charm to your wedding. Lean them up against a table or wall on their own, or use them to hold props such as signs. 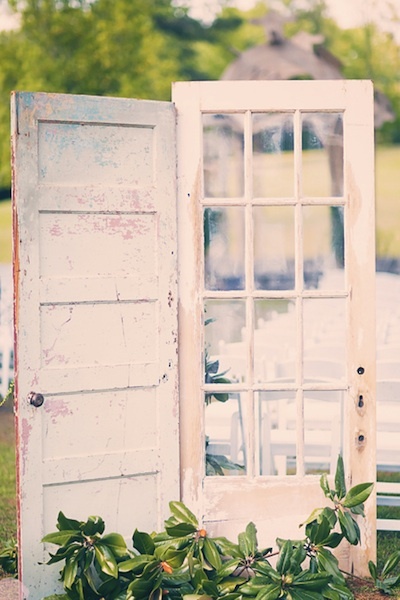 To create a neat “indoor space” outdoors, prop up vintage windows and old doors as ceremony backdrops, dividers or display boards. When it comes to using larger pieces, less is definitely more. Although the goal is for the space to be full of charming, antique goodness, it should also look effortless and sophisticated and not completely scattered or cluttered. A few large standout items will elevate any space while there may be a bit more give when it comes to using smaller pieces and trinkets. 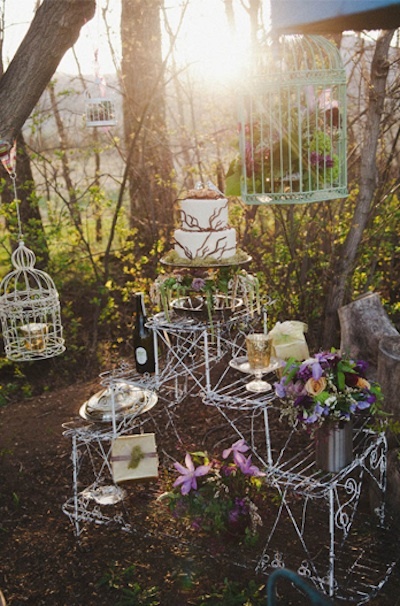 Birdcages make great card boxes because they keep the cards secure and safe, but there are other uses for the popular vintage item. 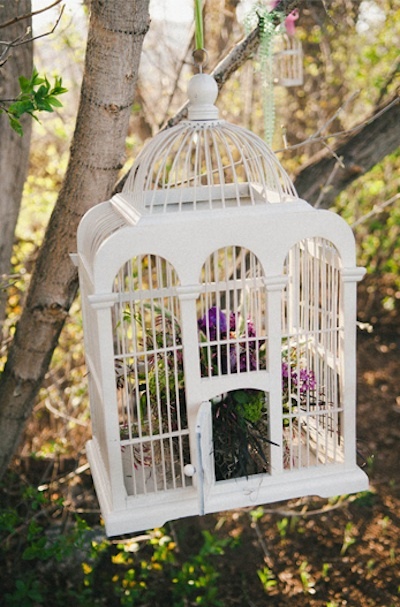 Hang a variety of copper, metal and wooden cages and add greenery to create an “outdoor” or “bird themed” display. The best part about the wired, transparent pieces is that the decorations don’t obstruct anyone’s view. 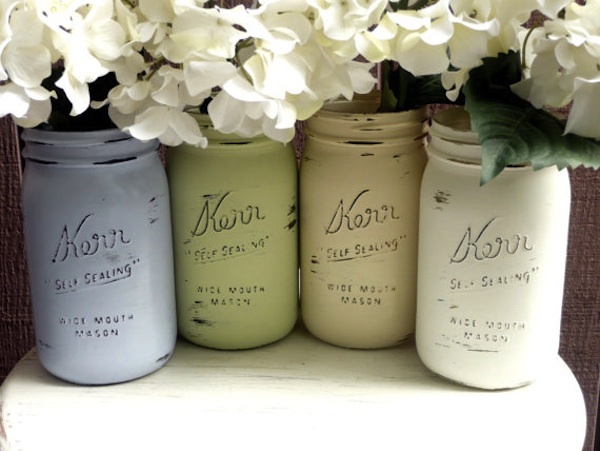 Older items that may not be safe to use anymore for their original purpose can be turned into decorations or displays. 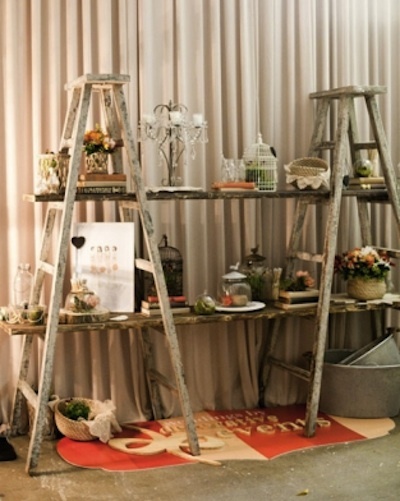 Place wooden planks across an old wooden ladder for a makeshift table or shelf. Drape a few quilts or old blankets over the rungs, prop up some books on top or use them as fun photo props to give yourself some height. 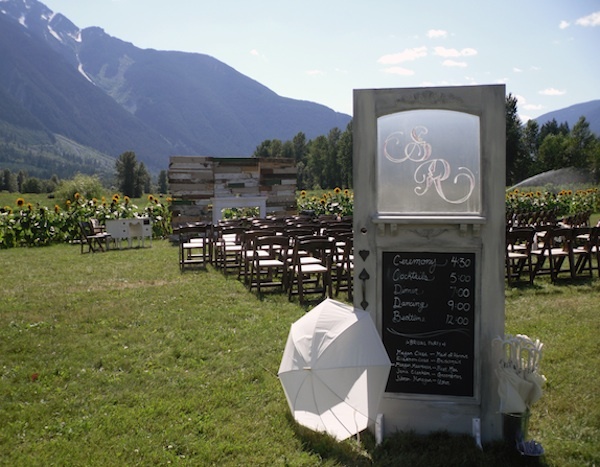 Speaking of photos, everyone loves a wedding photo booth for some reception entertainment. 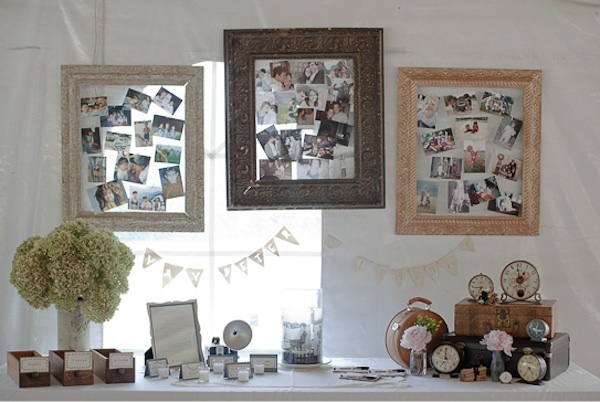 Use vintage frames to decorate your photo booth backdrop or create a vignette backdrop with hanging frames. 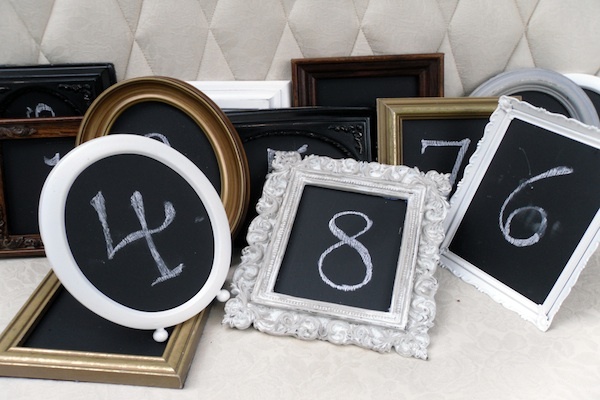 Frames are also extremely versatile when it comes to re-purposing them as signs and table numbers. 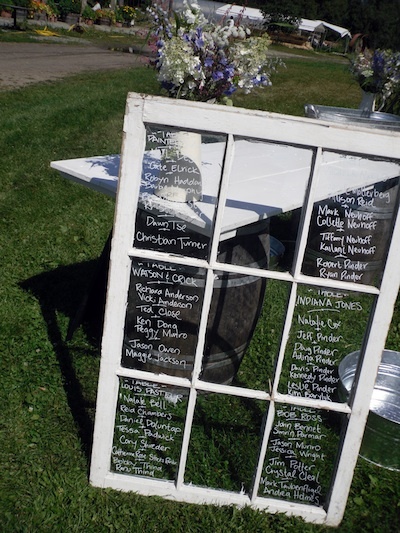 Place some fabric, chalkboard paint or paper behind the glass, or leave the glass out, for a quick and easy, but stunning sign. Learn how to make a chalkboard sign here. 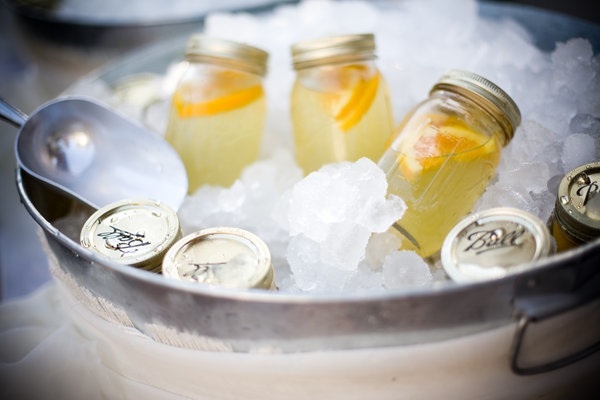 Mason jars continue to be a trendy pick for vintage weddings and there’s no wonder; they can be used for a variety of purposes, including as drink holders, lights and decorations. 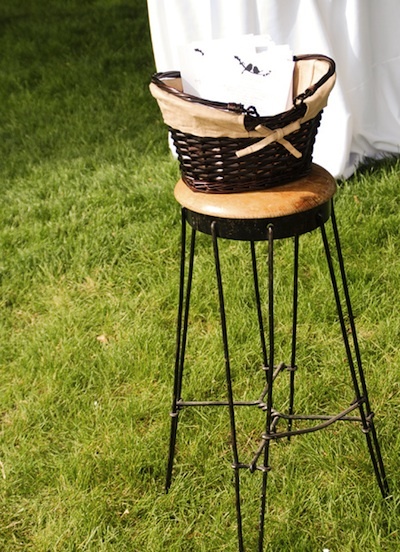 Looking for a use for all of those empty wicker and wooden baskets you have lying around? 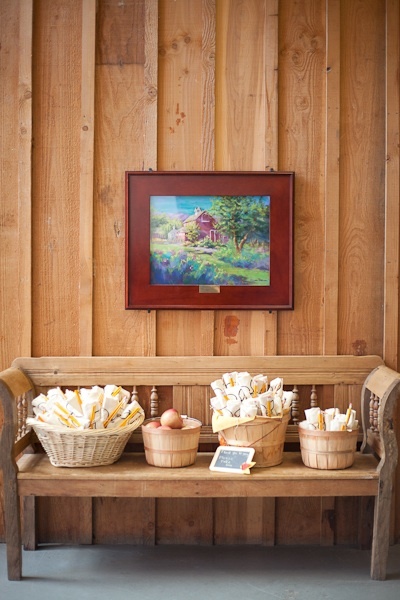 Decorating your wedding venue bathroom may sound odd, but a nice basket of goodies to help everyone spruce up will make them feel extra special. 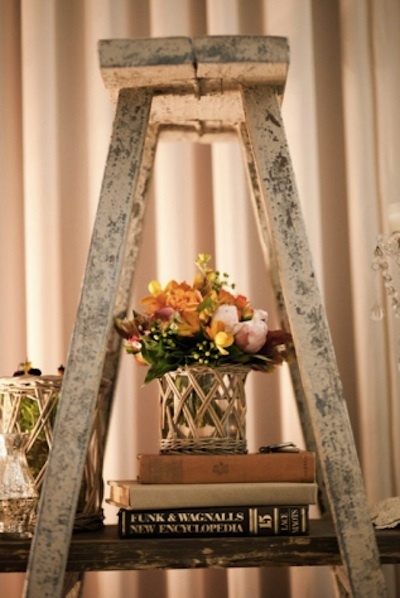 Another use for those crafty baskets is to hold flowers. 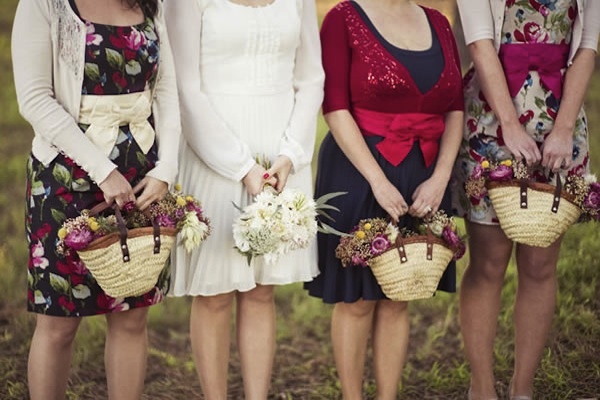 Swap out some traditional bouquets for a basket of flowers carried by your bridesmaids. 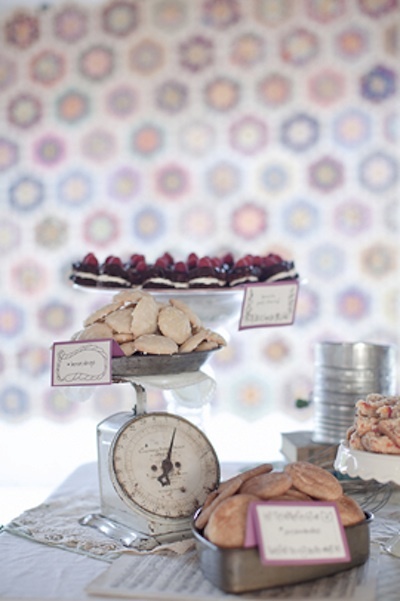 Vintage kitchen and food props, such as scales and pans, add a charming touch to a dessert table that will have you reminiscing of those good old days baking with family. Place cakes or platters on top of the scales and match with other neat vintage finds, such as pop bottles and old appliances. 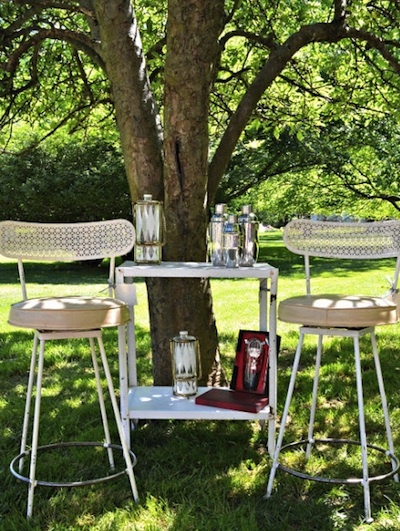 A vintage bar set up will have everyone sipping cocktails in classic, “Mad Men” style. A few grouped seating arrangements will be an appreciated rest stop for guests as they mingle whether it’s indoors or outside (and don’t forget those retro tunes for a classic, lounging feel). 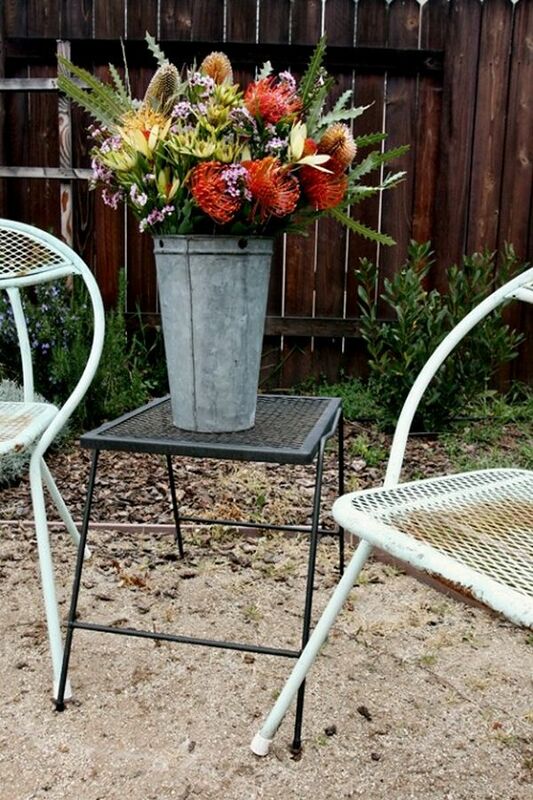 Finding your own chairs and stools, even if they’re mismatched, may even be more cost effective than renting high-end wedding chairs. 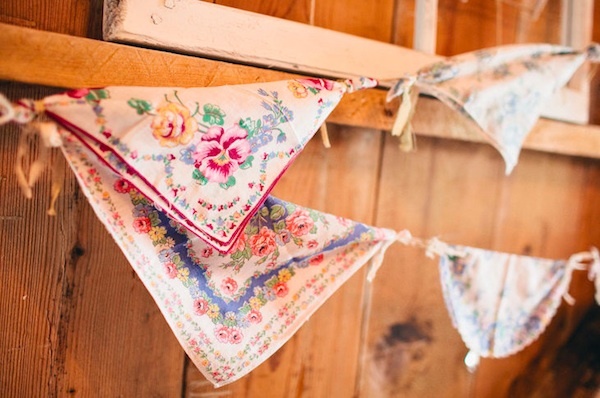 Instead of stocking up at a fabric store for wedding sewing projects, try a second hand shop or flea market for vintage linens. Depending on how much fabric you find, you may have enough to sew some cocktail napkins or bunting in different patterns and designs. Hand sewn hankies or napkin sets would even make delightful bridesmaid gifts or favours. 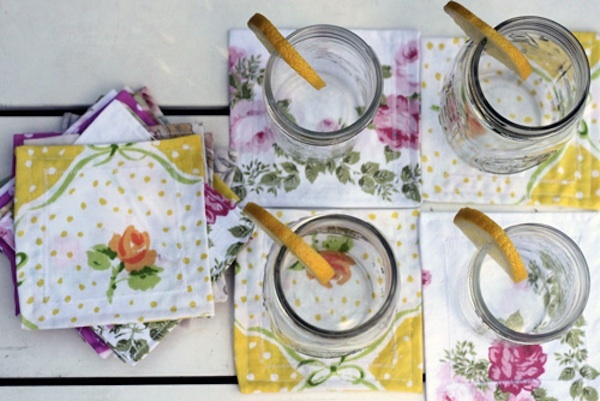 Check out this tutorial on DIY vintage napkins. Also, keep your eyes peeled for old quilts and blankets which can make splendid backdrops! We can’t forget the elegant, timeless appeal of antique silver. 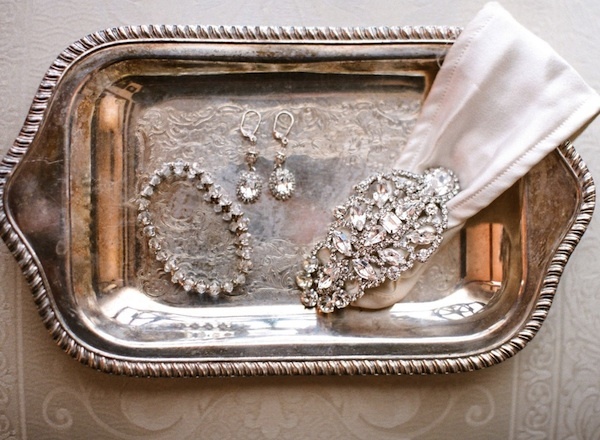 I love this vintage silver tray to display bridal jewellery while the bride is getting ready. Instead of sticking with your venue’s choice of silverware and flatware, collect your own interesting pieces to compliment your vintage dishes. 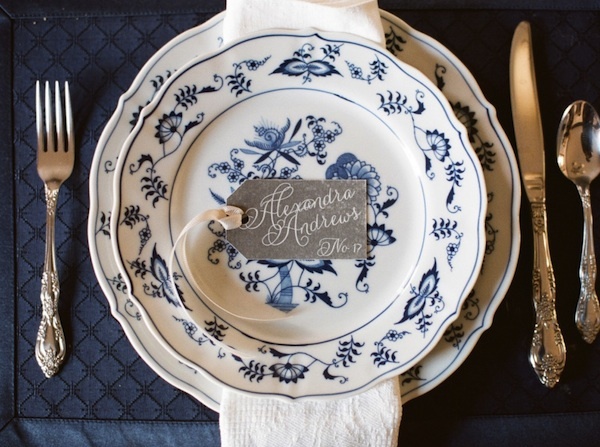 You never know what story lies behind a set of silverware or antiques; it’s all about celebrating history as you step forward into your new married life together. Vintage jewelry is a fantastic yard sale find! 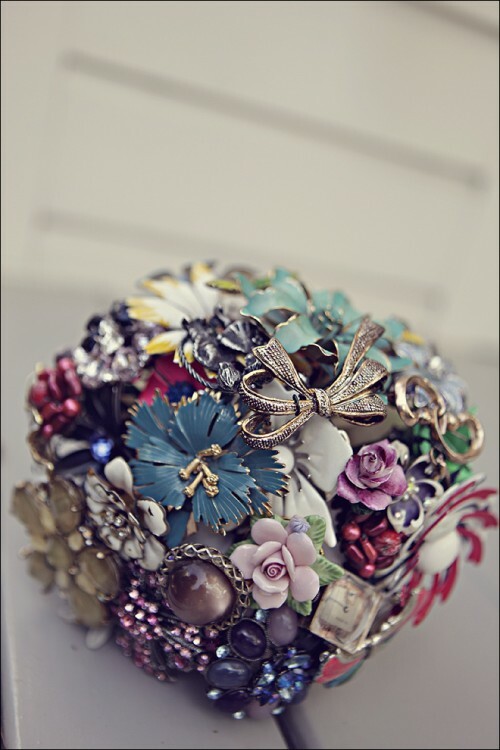 Wear the jewelry or make something beautiful for your wedding, like a vintage brooch bouquet. 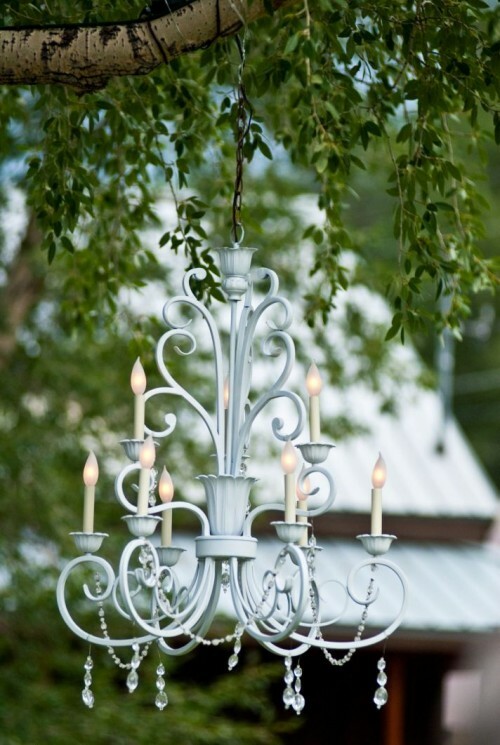 While we are on the topic of bling, if you stumble on a chandelier for a good price – you are one lucky lady! They look amazing hanging from trees or inside a barn. 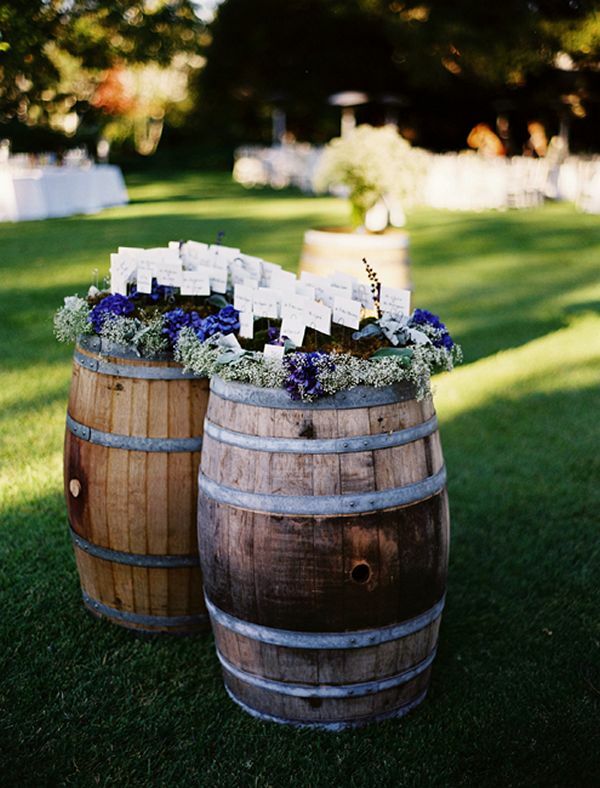 Speaking of barn weddings, galvanized pails and watering cans add a rustic vibe to an outdoor wedding. Fill the pails with ice and your fave beverage. Or add flowers. 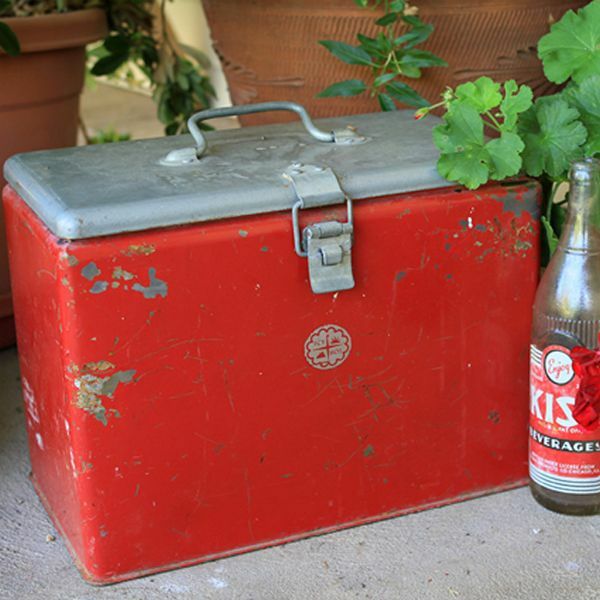 Vintage ice chests and coolers are also a great way to display your beverages. Vintage keys and buttons and always a great find! 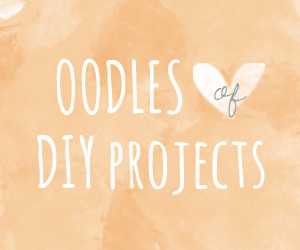 They’re both so versatile and great for DIY projects such as name cards or favor tags. 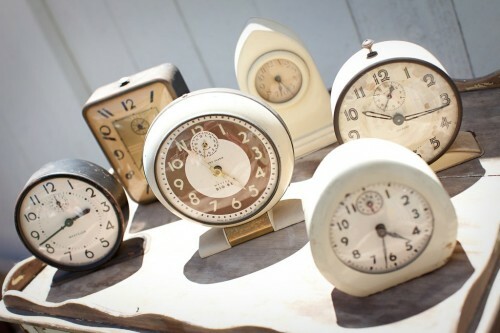 Old clocks add a charming touch to wedding day decor, whether they are functional or not. 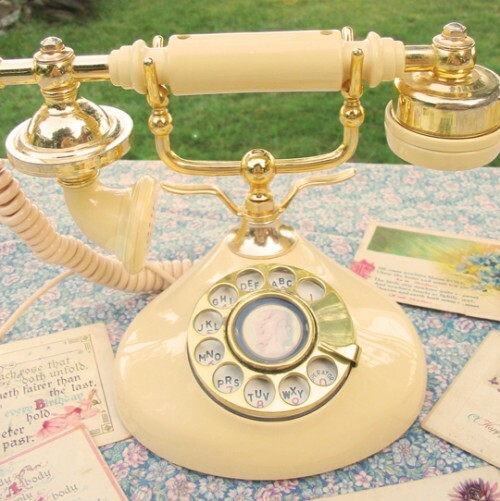 Rotary phones are also a fun way to add a whimsical, shabby chic touch to your wedding. Cameos are uber stylish right now. 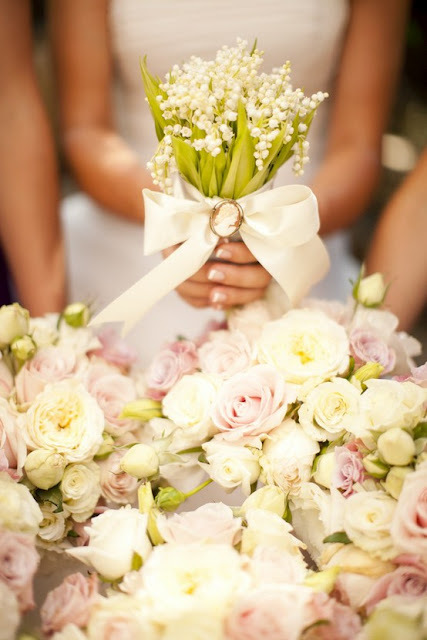 Wear them, or adorn your bouquets. 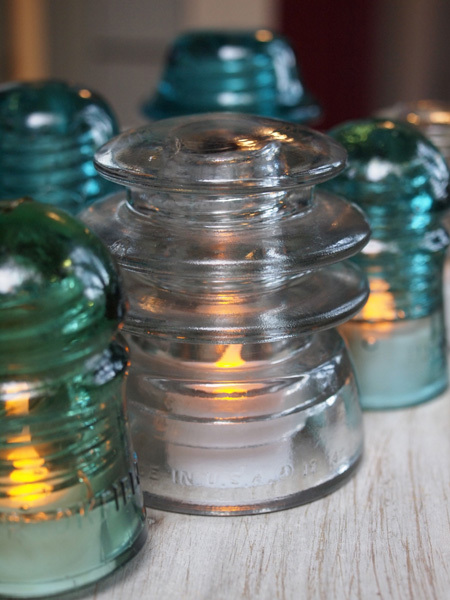 If you love old bottles and mason jars, you will love the look of glass insulators. 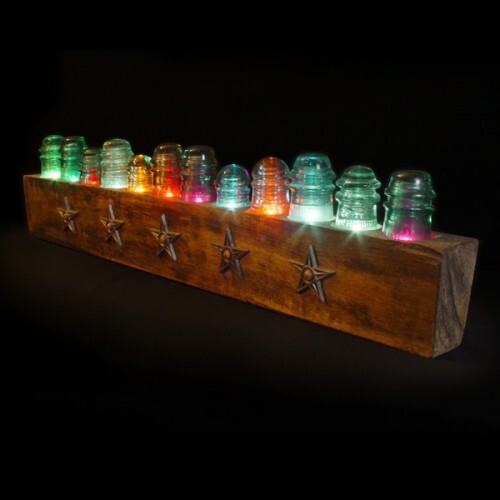 You can even illuminate them by placing a battery operated tealight beneath them. Phew! That’s quite a list. 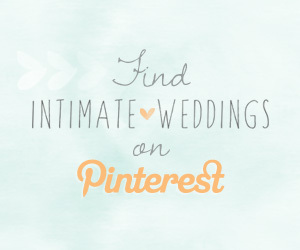 If you think we’ve missed some fabulous finds, please let us know by leaving a comment!